This is a picture of my scooter. My brother got it for me for Christmas. I love it. I live in Florida and do ride it a lot for shopping etc. I keep it in the trunk of my car. I live in a large condo complex that I can ride it around here too. I'm going to Seattle to a wedding for my grandson in July and I am going to take it with me. 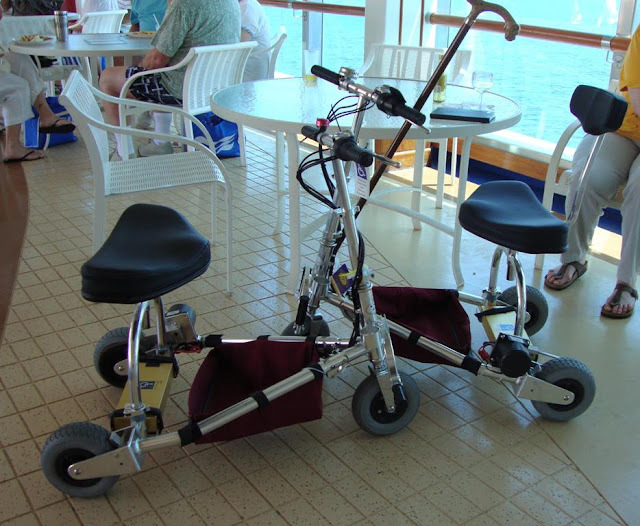 For those of us who have older TravelScoots and need a place to carry the tools this little Day Cruiser Mini Pack does the job nicely! You can get them from http://www.wheelchairgear.com/ . The Day Cruiser Mini Pack is $19.95 USD, and the No-Slip Grip-Clip is $9.95 USD. Here are various pictures of it so you get an idea of how you might use one to carry your TS tools or emergency what not. I also love the No-Slip Grip-Clips from WheelChairGear too. I am using one of them in all of the photos below to clip the Mini Pack too. 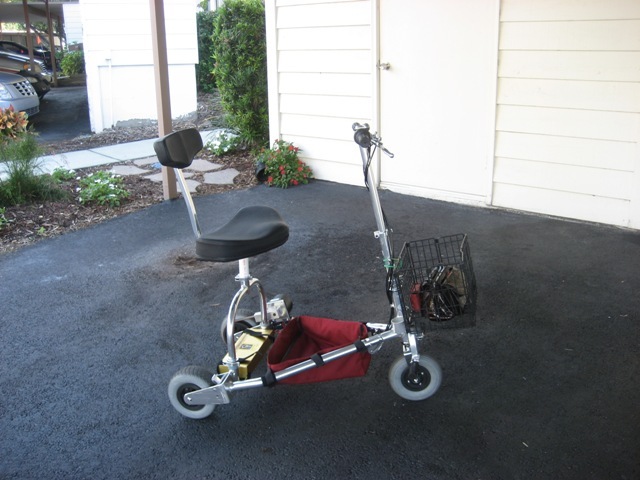 Here is a picture of my Scoot. I have fitted a flag as you can see. Also in the picture is a large luggage carrier folded up which I can use if I was to pack the scoot inside it's canvas bag. With the flag I removed the little cap on the back of the back rest, and then I pushed some heavy foam down the tube, about 6 inches down then I pushed the flag pole down, and it stays there. The large black wheels are a part of a luggage carrier which is handy to have if you want to pack your Scoot in to it's canvas bag, then you can push or pull the Scoot onto trains ,busses, etc. Hi Elizabeth, I met Marlee through your great blog about a year ago and we discovered about a month ago that we were booked on the same Princess cruise. 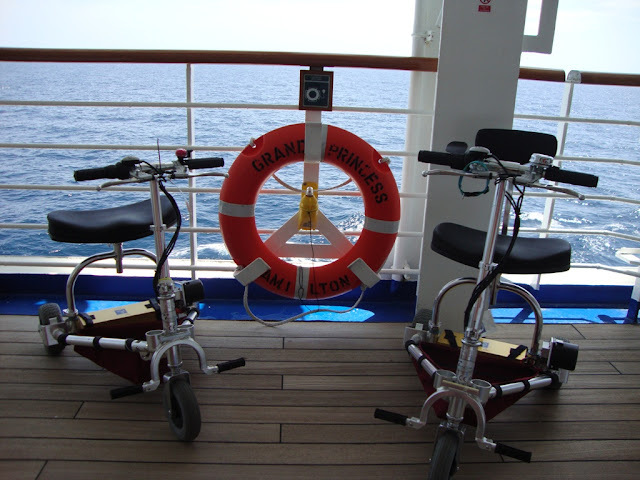 Here are a few pics of us and our scoots meeting up onboard the Grand Princess. Both Marlee and I were great "sales" representatives for Travelscoot and I handed out many of their business cards and gave more then a few demos. Being that it was a 14 day cruise lots of mature cruisers on board LOL. 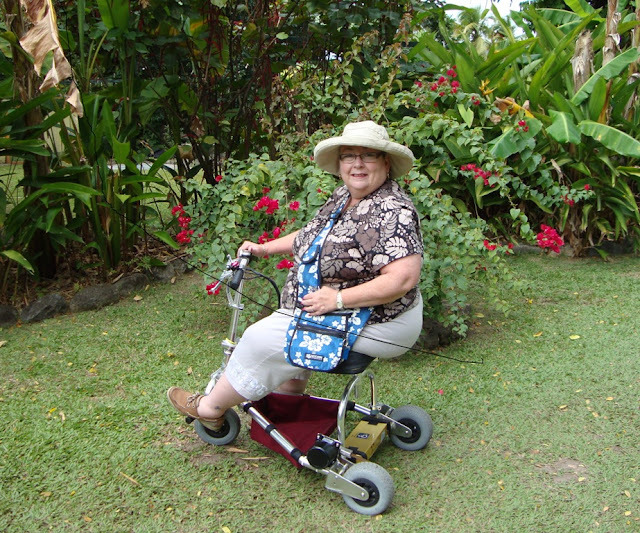 This photo is of Denise, and was taken recently in St. Kitts in the gardens at Caribelle Batik on Romney Manor on property that was once owned by Samuel Jefferson, the great great great grandfather of Thomas Jefferson. 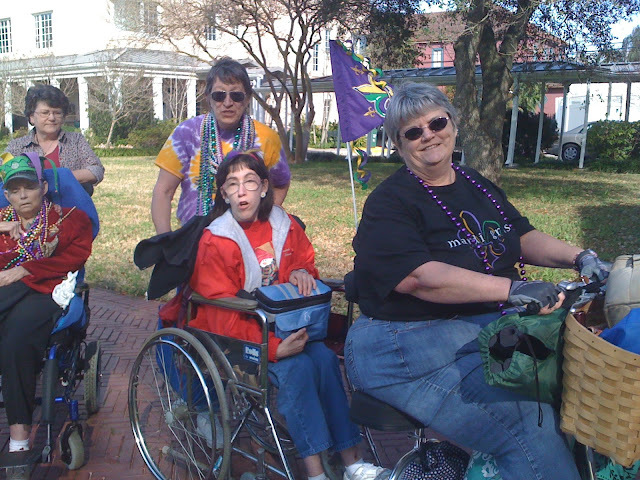 The Krewe of Peggy, a Mardi Gras Adventure! This adventure began with a broken seat on 2/24/2011, the Thursday before the first big weekend of Carnival Parades in New Orleans, leading up to the big day, Mardi Gras. I called Tony with my crisis. I think it took him a few minutes to realize it was a crisis. He suggested seeing if I could get someone to fix it. My brother, Bobby, came to the rescue. He had a piece of pipe, a flange, and the equipment to make it work. He was able to cut the pipe, file it because it was a little big, tread it so he could put it into the flange and then bolt that to the aluminum plate under the seat. Thank goodness. I use my scooter daily as a teacher of high school students with autism. We take them in community to learn how to make purchases and explore potential jobs. The scooter allows me to go everywhere. Since Bobby got my temporary (now backup) seat to work, I was able to e-mail Tony, order a new seat and have it shipped. It would come in the Friday before the next big weekend of parades. This was important because I needed to be able to put the seat back on. With Bobby’s rig, the seat didn’t snap into place. I needed to be able to put a flag on the seat back so that people could see me better when I was riding in the street. New Orleans sidewalks are terrible, courtesy of all of the large live oak trees. In the street I might have to dodge pot holes but didn’t have all the breaks as in the side walk. The weather was beautiful today and we didn’t need to bring the ice chest. You can see I was loaded down. We were a comical site with me in the lead, Anne following, and then Diane bringing up the rear. 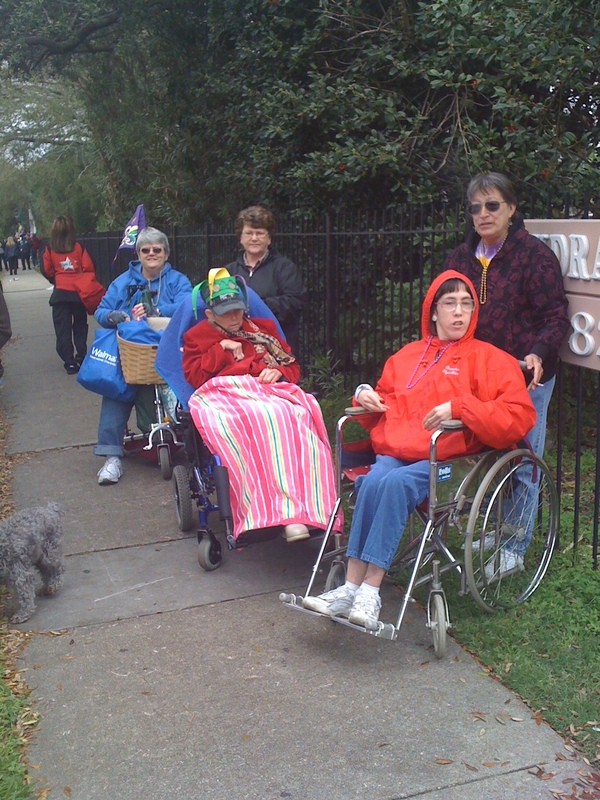 Anne is a resident of Poydras Home which is on the parade route. They have a BBQ for the residents and their families on Sunday. I brought my friend Sandy to push Anne’s chair, Diane and her mother Carole came along too. Anne knew all of these people and enjoyed sharing her “home” with us. We were just glad of the most precious commodity at parades, a BATHROOM! We also enjoyed spending time with Anne. Rhonda relayed this story to me earlier today, and I don't know if I can do it true justice (or convey her sense of enthusiasm! ), but I'll bet that some of you out there have had similar experiences where you just happened to be in exactly the right place at the right time. Last week Rhonda's mom was visiting, and Rhonda and her mom set out to do a whirlwind of shopping -- two big malls, several department stores, a few Walmarts, and I'm sure there was at least one visit to Target. In the parking lot at Burlington Coat Factory, a man came hurrying toward her, cane in hand, wanting to know more about her TravelScoot. 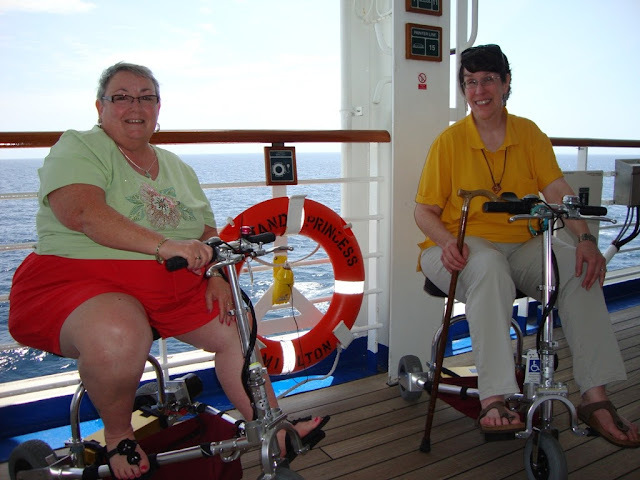 After you've had a TravelScoot for awhile you get where you can tell who is serious, and who just wants one for fun. It was obvious this man had been searching for the perfect scooter and knew it when he saw it. It was pure chance that put them in this parking lot in Baton Rouge, Louisiana at the same moment because this wasn't a store Rhonda went to often, and the man and his wife were from Mississippi and just happened to be in town that day. Rhonda gave the man one of Tony's cards and answered his questions. She also gave him her phone number, just in case. The man has a medical issue that's progressively worsening, causing him to need help walking distances. He needed a scooter small enough to fit in the trunk of his sedan. It also needed to be lightweight enough for him and his wife to handle. Over the weekend Rhonda heard from the man. He'd called Tony and ordered a TravelScoot, a lithium ion battery, and an SLA battery. 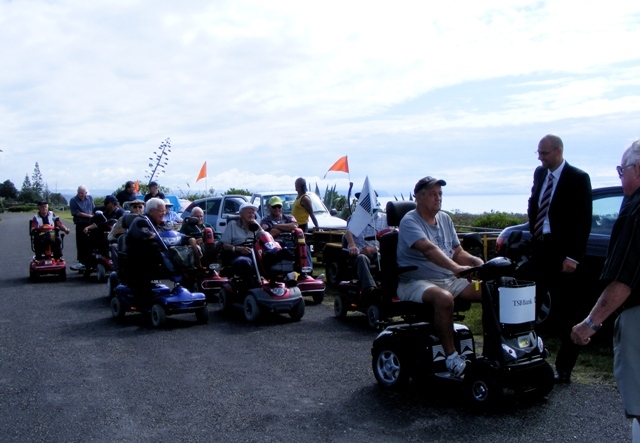 He said he told Tony that he had met Rhonda, and called her "An Angel on Wheels." I had a tear in my eye by the time Rhonda finished the story, because I know what it's like to be that man, searching for something you're not even sure exists and all the sudden it's right in front of you. That's how I felt late one night when I was searching the internet and happened upon the TravelScoot site. 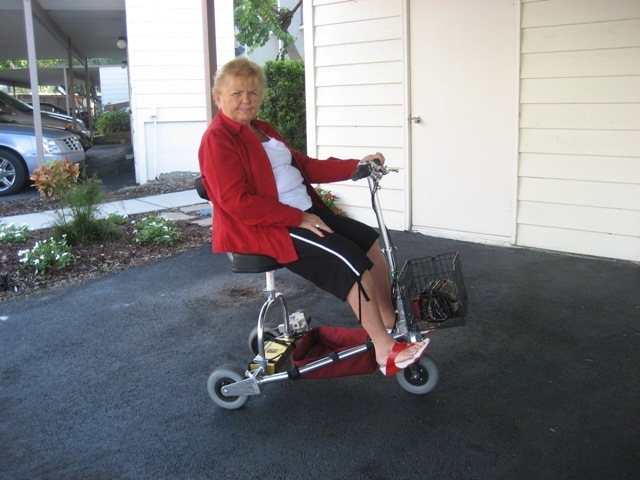 Rhonda shared one of her favorite moments when she first rode her scoot, feeling the wind blowing her hair. He couldn't exactly identify with that (given his lack of hair), but said he was looking forward to feeling the wind on his face. 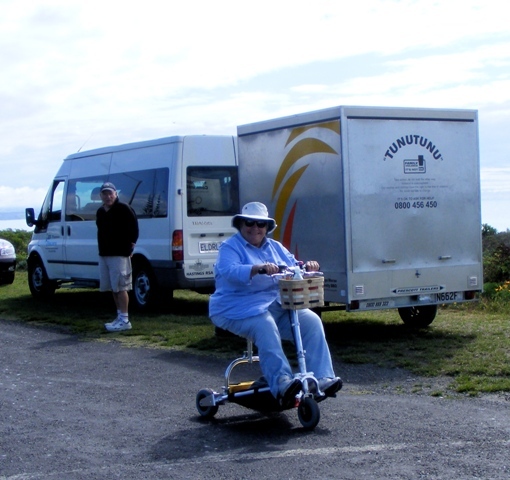 "Has anyone traveled to Ireland on a coach tour and taken their Travelscoot? I am not getting very friendly reception from the tour groups when I ask about using a Travelscoot. 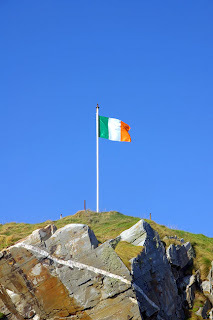 Have any readers used one traveling in Ireland?" Dean Hughson was recently honored for his upcoming 60th birthday by his company, Henningsen Foods, in the Japanese traditional way. He was given a vest and hat which signify that he has been through 12 Zodiac cycles and has now gained wisdom. In Japan, all workers who reach the age of 60 have a ceremony where they break open a keg of sake (Japanese rice wine) and are honored for the day. Dean's company is part of Kewpie Corporation which is the largest mayonnaise and egg products company in Japan with annual sales of $5 billion US dollars and has over 5000 employees. Dean was born in Dr. Goldberg's office in downtown Braymer Missouri April 30, 1951. 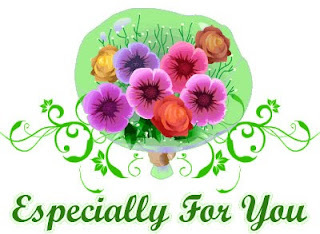 I love your blog and look forward to getting all the notifications of news. 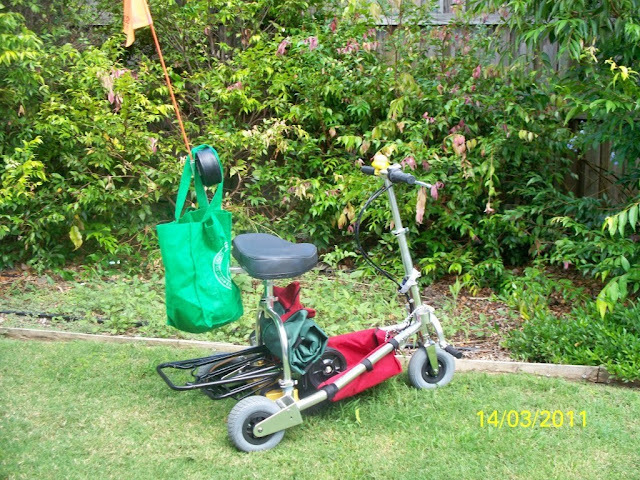 I have just come back from a Mobility Scooter Rally organised by the Hastings, Napier and Flaxmere Age Concerns. You may notice I have a Peterborough basket on my scoot. It is very handy and I got all the idea and info from you !!! One thing though, is there any advice on how to pack the Travelscoot into the bag ? I get in a terrible muddle. I will get back to you if I have any more adventures. I've already started my adventures! My best friend and I went to the mall, lunch and more malls- a perfect girls day out! There's no way I could have done it without my Travelscoot. I was surprised that I could carry it down the stairs- it was a lot easier than I thought it would be. I put the seat pieces and battery in a backpack and carried the frame in my hands. I didn't know that it locked shut- that was a huge blessing! I could hold it however I needed to in order to get down the three floors to the car. The 'cub' battery lasted the entire day and never showed a low signal. It took about a minute to get set up and going. Not bad for a first time! I'm sure I'll get faster as I get used to it. I loved how I could back up and reposition myself without having a loud 'Beep Beep!' accompanying my movements. I'm big enough- I don't want to beep too! I opened up the throttle to full just to test it out- my friend had to run to keep up with me. 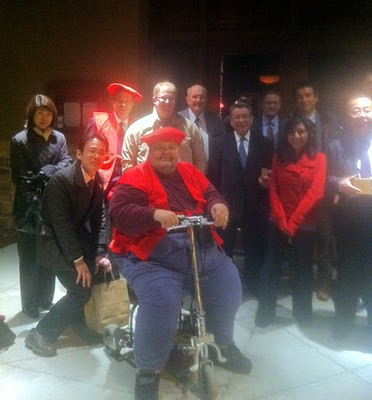 The Travelscoot really moves! We had a good laugh over how I'm going to be her trainer now- like in the Rocky movies. She can shut me up if she can catch me on my Scoot! The only thing that didn't work for me was the seat. I had too much pressure but I also have bad posture and trunkal weakness from my illness so that's to be expected. Hubby is a mechanic so we're going to see if we can fit a special seat on Scoot for me so I don't develop a sore. I took a page from the blog and removed the seat back and that helped get my sitz bones more supported. I got to shop (found a great formal dress for twelve dollars! ), go out to eat and just enjoy being outside. I never thought I would be able to do those things again. The lines no longer mattered because I wasn't in pain. I wasn't afraid that I would fall in public and be embarrassed or even worse- be hurt! It was wonderful! All that's left to do is to name my Travelscoot. We're using 'Scoots' right now- but that will change. I was thinking of naming her 'Giddy' because that's how she makes me feel. She also gives me my 'giddy-up'. Thank you again so much for your blog- I never would have thought it was worth it till I read all these adventures! Elizabeth, thank you for sending me your Blog. My name is Peter I am a 83 year old man and I live in Australia . I only bought my TravelScoot about one month ago and I love it. Welcome, Peter, and thank you for the flowers. Happy scooting!